[SINGAPORE] For the first time, a local bank will be giving its employees payouts from the Wage Credit Scheme (WCS), instead of using the funds for training and development initiatives. OCBC Bank will be disbursing $3 million of its first WCS payout to 1,500 eligible Singaporean employees of the bank and its securities subsidiary, OCBC Securities Pte Ltd (OSPL). Introduced in Budget 2013 as part of the three-year Transition Support Package, the $3.6 billion WCS helps firms cope with rising wages in a tight labour market. It also encourages businesses to channel resources towards enhancing productivity and subsequently share productivity gains with employees. The WCS payouts co-fund 40 per cent of pay rises given to Singaporeans who earn a gross monthly income of $4,000 and below. The 1,500 recipients of OCBC's WCS payout make up about 25 per cent of OCBC and OSPL's total staff strength in Singapore. Most of these recipients are junior executives and unionised employees, serving as assistant managers, bank officers and clerical staff in the bank's consumer financial services as well as operations and technology divisions. They will receive the payouts in June and July. Recipients can opt to have their payout credited to their Central Provident Fund (CPF) accounts or to invest in shares through the OCBC Blue Chip Investment Plan, which is open to all employees of the bank. Employees can choose only one of the two payout options. OCBC employees who opt for the CPF top-up scheme will have their payout credited into their CPF accounts in one lump sum. For those who choose the latter option, they may invest the payout in blue-chip stocks via the OCBC Blue Chip Investment Plan in two ways: investing monthly over a maximum period of six months, or in one lump sum. A minimum amount of $100 a month can be invested in a selected basket of 20 blue-chip stocks. OCBC Bank's Group CEO Samuel Tsien said: "The amount, for each of the 1,500 Singaporean employees who will benefit, may not be large. But by empowering each individual to either put that amount in a personal CPF account that earns a decent interest rate, or invest it in the OCBC Blue Chip Investment Plan, we hope to contribute to his or her long-term saving or investment plan - a key component in good financial planning. And good financial planning makes a big difference, given today's rising cost of living." Ernest Phang, head of Corporate Services, Group Human Resources, said 20 per cent of the $3 million payout received from the government is due to employees who have left the bank. 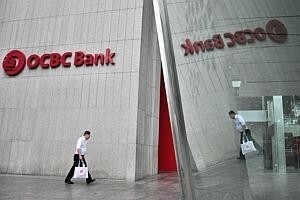 This sum will be channelled back to OCBC's training budget for the development of its staff.